1. We hadn’t done anything with the tomatoes I bought last week, so tonight is spent making tomato soup and Vicki’s roasted tomato sauce, which all the knitters swear by. Our apartment is ridiculously warm now, but, man, it smells so good! 2. While the park showing Wonder Woman seems to be carpeted with Astro Turf (or some derivative), it is significantly cooler than the areas around it and thus a significant improvement on the paved park where the films used to be held in that neighborhood. 3. Rudi has Monday off and I have a Groupon for the restaurant in the museum next to my office. We have a lovely lunch date in the air conditioning. More Posey sock knitting, more Posey sock unraveling (with Jeremiah supervision, as you can see in the above shot). In this case, I accidentally pulled seven stitches off the needle and dropped them. I fixed that in the dark (by the light of a nearby streetlight) while watching the start of Wonder Woman tonight, but missed a row on one stitch, so had to drop it back down to catch it back up. The good news is that I probably only had four rows of dropped stitches originally, so the rest is progress made during the film. 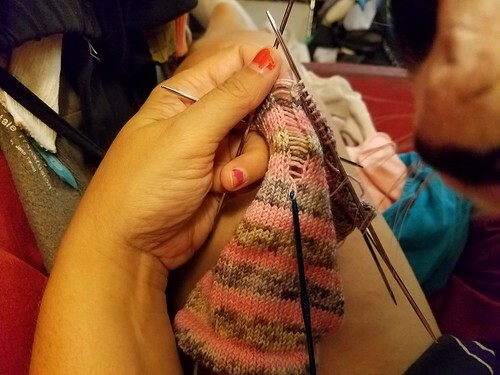 I’m nearing the heel, but it’s looking less likely that I’ll get them done by Friday night, which was my goal. I’m more than a third of the way into Spinning Silver and all three of the girls — Miryem, as the queen of bloodthirsty winter elves; Wanda, on the run with the brother who accidentally killed a man while protecting her; and Irina, the new wife of a tsar she is pretty sure is a warlock — are on the move now. On audio, I’m listening to The President Is Missing, a political thriller from James Patterson and Bill Clinton. The story is fine, but nothing extraordinary, so far. Head over to As Kat Knits to see more crafting and reading posts. Category: books,cats,knitting. There is/are 3 Comments. Category: arts,life -- uncategorized. There is/are 1 Comment. This morning the heat came back and this afternoon the humidity joined it, leaving air that you felt might be possible to slice into like a pie — and just as oozy. I’d invited Rudi to come up to the park before I’d actually left work or else I might simply have gone straight home. Sitting on the park bench felt neither cool nor refreshing, but the colors of the evening sky did make the extra few blocks’ walk worth it. Tomorrow evening we’re going to watch Crazy Rich Asians from an air-conditioned movie theater, but Wednesday night we both have outdoor activities planned. I’m hoping for a mid-afternoon thunderstorm and a breeze to make things cooler by then. I hope more temperate weather is gracing your lives, too. I spent a lot of time outside this weekend. On Friday night, we took ourselves out for pizza and sat out on the patio admiring the moon. Today, I headed over to Virginia to protest the Kavanaugh nomination to the Supreme Court. Have you called or emailed your Senators yet to ask them to vote no on his confirmation yet? Senate offices are reporting they haven’t heard from an overwhelming number of constituents on this issue, so it’s particularly important for you to have your voice heard. Hearings are due to start a week from Tuesday, so this will be a critical week to reach out, particularly if your Senators haven’t made a public statement about their stance. Why is there no term for that level of relationship between acquaintance and friend? Pal, maybe? Anyway, my pal Joanne and I went out for lunch afterwards to a place that served what they called meggrolls (and that I probably would have said was a deep-friend empanada). I opted for a veggie pizza roll and a summer fruit cobbler roll, each of which I ate half of and then brought the other half home for a tasty mid-week lunch treat. Since I was in Alexandria already, I stopped at the local charity shop to see if they had any frames for some artwork we have. They were having a half-price sale on art, so I came home with two frames I think will work for our purposes. I’m excited to take them apart and see how our prints look. 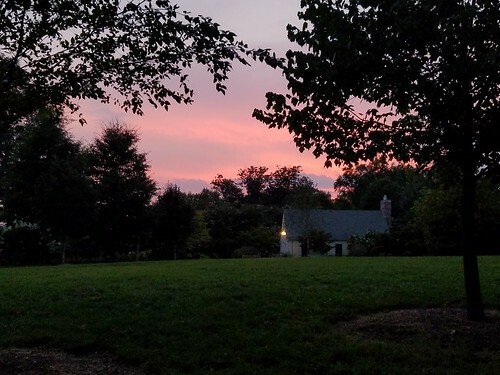 The weekend also included pool time on both days (today was the last day the pool closest to me was open for the summer), gardening (we harvested lots of tomatoes and basil, cut back some of our overgrowth, and enjoyed the local fauna), and evenings in the park. There were mid-afternoon naps, a Twitter chat, and cuddling with cats. We caught up on Elementary and started watching the Vuelta a España bike race. We ate suppers that featured veg we’d grown, and I knit and read (so far I’m enjoying listening to The President Is Missing). All in all, a very full, but lovely weekend. 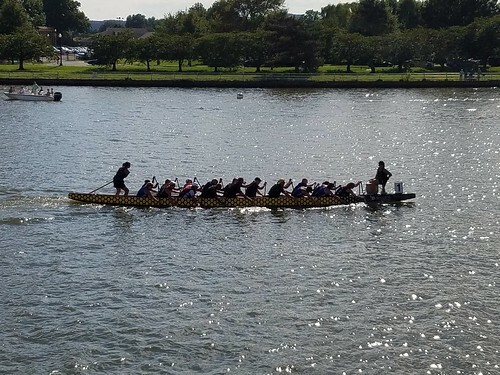 Today’s reading was from Spinning Silver, and I read at the Wharf, while waiting for the dragon boat race to begin, and at the park until it got dark. I also downloaded the audiobook for The President Is Missing, which I’m looking forward to listening to as I was dishes tonight. Today’s challenge is to make/meet stretch goals. It’s the last day of the readathon, so today’s challenge is to take a look at the goals you set for the week (if you have them) and decide a) how you can stretch yourself to complete them or b) how you can revise them so you can meet them. Take part in at least two challenges and at least one of the Twitter chats. I took part in both Twitter chats and this makes the second challenge. 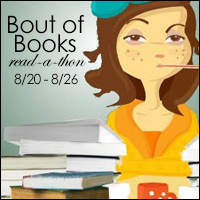 Visit at least one other Bout of Books participant’s blog a day. I decided earlier in the week that this goal was more about actually leaving comments at participants’ blogs and that if I did that for seven different blogs, I’d be good. I’ve done four and have three more to do tomorrow. Read a little each day.